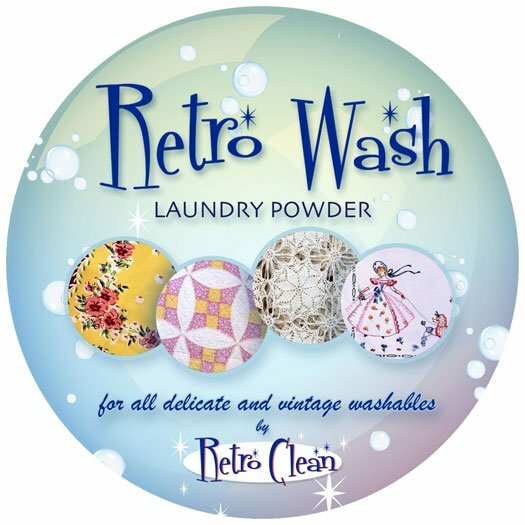 Retro Wash laundry powder is the solution for cleaning your delicate and vintage textiles (quilts, linens, clothing, lace, etc) safely and effectively. Its gentle cleansing action is tough on dirt & ordors. It works exceptionally well on all fabrics, including cottons, silks, and wools, leaving them fresh and clean. Retro Wash contains NO dyes, phosphates, brighteners, perfumes and leaves no residue. Retro Wash IS non-toxic, hypo-allergenic, biodegradable and highly concentrated, 1 lb. makes 160 gallons.